Cranky Concierge keeps growing, and that means it’s time for us to hire again. We’re looking for another Travel Architect to join the team. What does a Travel Architect do? Well, this job is mostly about searching for and booking flights, hotels, and more. (Paid tickets, not using miles.) But honestly, we’re just growing quickly, and we need someone to join the team and be able to really help in a lot of different ways. 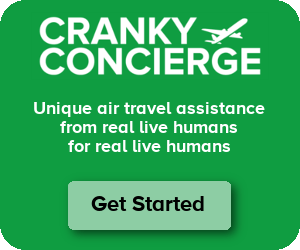 I’ve put a job description up at crankyconcierge.com/jobs. Have a look, and if you or anyone you know is interested, then read the details on how to send them our way. EDIT: We are currently well into the interview process and are suspending applications. I’ll put another update if we reopen them. Congratulations on your business’ success. I hope it continues long into the future. I would LOVE this job..but I am moving to the UK in two weeks. Let me know if you need someone who can be awake at crazy hours for PT, and someone who can help clients already in Europe! Michael – Doesn’t matter to us where you’re located as long as you can work the hours we need. So if you’re interested, feel free to send your resume over. From what I know, there’s probably only one person in the world who possesses all the skills you’re looking for. And, I think you already have him…YOU! “Common sense ability” and someone who will “like dealing with people and understanding what they need….” For this today, your pool of prospects might not be too large. I didn’t know you offer “travel architect” services. I have used you happily for booking award flights and when I see your website you seem to be all about airline flights. What is the “more” you do in addition to flights and hotels? If I want to go to Italy and see a marble cutting and polishing operation, can you do that? jonathan reed – If people are looking for specialized experiences in a destination, we’re happy to refer people to local specialists. But in general, we can handle hotels, car services, car rentals, cruises, etc. But if people are looking for something very detailed and we don’t have the experience, then we find others who do.